The following is a re-post from a few years ago. I find it to be most appropriate today. 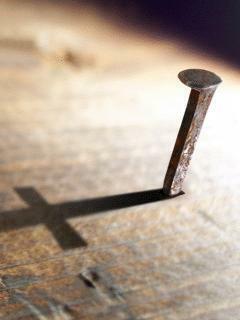 Consider the common nail. Its purpose is to hold things together; its design suits its function very well. When a nail is first employed its sharpened point violently and efficiently pierces the surface of the one material to be fastened to the other. Driven deeper and deeper, the nail finally penetrates the one, and then begins sinking deep into the other. Given enough length, the nail will finally penetrate the second object where its shaft may be bent over so that the two in essence become one providing great strength and security. The two objects are joined, affixed. Only until one is ripped from the other, or the nail straightened and driven back can the two be separated. This entry was posted in Grace and tagged Christianity, Cross of Christ, Crucifixion of Jesus, Good Friday, Holy Week, Jesus, religion. Bookmark the permalink.